Beautiful Green and White Balloons! When I was younger I had dreams of becoming the president of Ghana until my mum told me being a president isn’t a profession. She said to be a president in Africa, you either have to be a cruel dictator or you’ll get assassinated. Now before you even start to wonder why a 9 year old boy will have such dreams, allow me to explain. I was born into a middle class royal tribe/family in Ghana but lack was not unfamiliar to me. Along with it, came the keen ability to become aware of the poverty of those around me and I always questioned my mom as to why we couldn’t afford everything we needed and why the president wasn’t giving everyone enough money to live comfortably. That was his job I thought, and if he wasn’t willing to do it, I was ready to step in so that I could change the system and make everyone feel comfortable. I no longer have plans of being a president; but, my desire to create a positive change still burns deep inside of me. Longing for a change after high school, I decided to study abroad. Shall we say, Russia? Yes I know you are asking ‘why Russia’? Honestly, it was simply the only option available to me at the time. But now I prefer to say it was ‘fate’. If you’ll agree with me, not everyone just wakes up one day and decides to move to Russia. My mother was very unsure about my decision and told me it wasn’t too late to change my decision even the day prior to my flight. Well, you could understand her concern, for the first time in her life, her last baby was going to flap his wings and fly away from her nest to find shelter in a foreign land. Talk about cultural differences, the famous Russian stereotypes, the language, the weather and oh yes the snow. I had never experienced a snowfall in my life! I, however, welcomed the experience because I thought I was a full grown man and I had growing facial hair to prove it. Low and behold, it didn’t take too long for me to experience the biggest cultural shock of my life. I arrived in my hostel room where I lived with a Portuguese and an Arab. None of them spoke English. We were so different to the extent that even the way we cooked rice was even different. Can you just imagine that? Before I got there I didn’t even know there were different techniques of cooking hard boiled rice! My roommates and I vowed that we were going to learn the Russian language in the shortest possible time because we were tired of looking silly in the shopping malls. All we ever did was to point and pay. I wonder what the Russians thought. This decision I made, changed my life. It gave me to opportunity to participate in the “Many Languages, One World” 2015. I wrote my essay in Russian and got chosen as one of the winners. 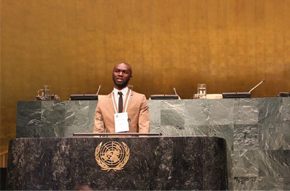 This gave me the opportunity to visit New York City for the first time in my life, and the icing on the cake was when I had the opportunity to share my ideas at the United Nations general assembly. I felt like the president of Ghana. The time I spent in New York with MLOW was indeed the best week of my life. I can hardly find words to describe the wonderful experience. I might have to write a book on it just so you have a little idea of what I’m talking about. Sometimes not everything in life makes sense and life itself can be very unexplainable and random just like the title of this blogpost. Although the future is still unpredictable like a girls’ mood, I remain hopeful. From now onwards and even after I graduate from medical school, I’m going to use my experiences and skills to help bring positive changes to Ghana my motherland, Africa my home, and the world as a whole. Dear friend, what do you think you can also do to promote change? Maybe you can learn a new skill or language, maybe you can travel or study abroad, or maybe you can just share this post to motivate someone else. I believe the time is now or never.